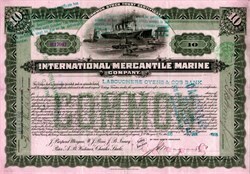 Beautifully engraved stock certificate from the International Mercantile Marine Company issued in 1905. This historic document was printed by American Bank Note Company and has an ornate border around it with a vignette of ships in a harbor. This item has the signatures of the Company's Agent and is over 113 years old. The certificate has the names of the Voting Trustees printed on the face. The names are J. P. Morgan, W. J. Pirrie, J. Bruce Ismay, Peter A. B. Widener and Charles Steele. Pre Titanic sinking certificates with the Trustees' names printed on the front are very hard to find. The certificate was issued to Arthur Hill and is endorsed by him on the verso. Stamp cancelled. 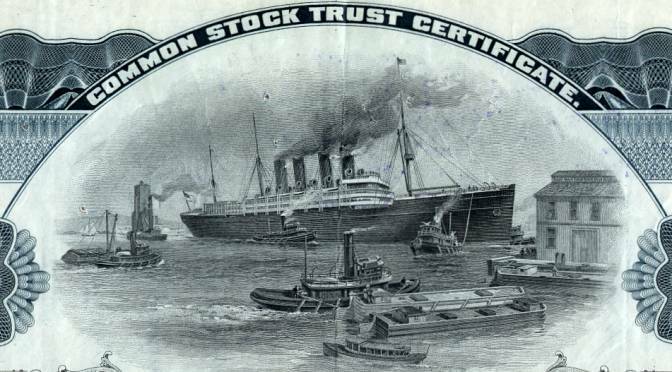 The International Mercantile Marine shipping trust was formed in 1902 by J.P. Morgan. This company controlled the White Star Line which constructed three sister ships the Olympic, Titanic, and Britannic which are depicted in the unique, nautical vignette. Each of these ships was identical in size being 882 1/2 feet long and 92 1/2 feet wide. 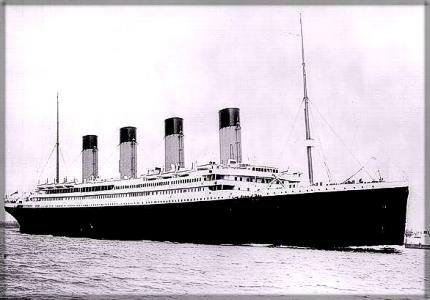 The Titanic sunk on its maiden voyage on April 15, 1912, after striking an iceberg at 11 20 p.m. on April 14,1912. Suddenly, a man holding a baby came up to her. Although he didn't want to be saved, there was no one to save the baby. With no one else willing, Winnie said that she would save the child. She now had a good reason to be rescued. She then made her way to collapsible D and a crew member helped her and the baby into the boat. Once the boat was loaded , Chief Officer Wilde ordered it to be lowered. As it slowly descended to the water, passengers Hugh Woolner and Mauritz Bj�rnstr�m-Steffansson, who had helped load and launch collapsible C, saw that although the boat was mostly full, there was a small space in the bow of the life boat. The two men leaped over the side of the ship. Steffanson landed in it the life boat, but Woolner found himself hanging over the side and Steffanson pulled him in.